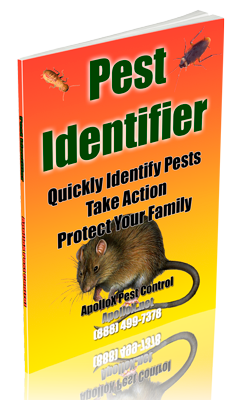 ApolloX Pest Control will remove Indian meal moths from your home quickly, efficiently, and safely. 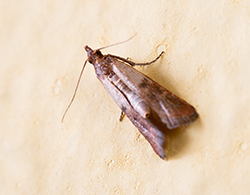 It is easy to distinguish the Indian meal moth from other grain pests by the peculiar markings of the forewings; they are reddish brown with a copper luster on the outer two-thirds, but whitish gray on the inner or body ends. The hind wings lack distinctive markings and are more or less uniformly gray. Adults can be seen resting on the grain surface or grain bin walls. The adults fly at night and are attracted to lights. Newly hatched larvae are very small and difficult to see. Larger larvae are usually yellowish, greenish, or pinkish. Fully grown larvae are one-half to five-eights of an inch in length with a brownish head capsule. Larvae have three sets of legs near the head (thoracic legs) and five sets of prolegs on the abdomen. 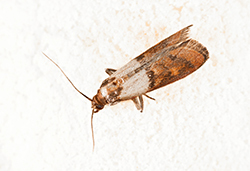 The larval stage of the Indian meal moth lasts from two weeks to one year, and is responsible for grain losses. In grain, larval feeding is usually restricted to the top one to two inches. Larvae of the Indian meal moth spin a web as they become fully grown and leave behind silken threads wherever they crawl. The webbing is often sufficiently abundant to attract attention. 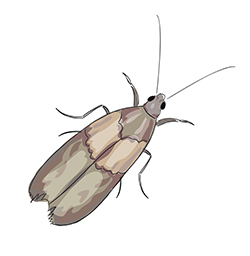 Loosely clinging webbing on the grain is characteristic of this pest. A mature Indian meal moth female lays 100 to 300 eggs on food material, either singularly or in groups of twelve to thirty. The eggs are whitish, ovate and very small. Because of their small size, they are difficult to see without the aid of a microscope. Eggs are deposited on the grain surface singularly or in groups of twelve to thirty. When mature, larvae spin a silken cocoon and transform into light-brown pupae. The cocoons and pupae can be seen on the grain surface and walls of grain bins. Adults emerge in four to thirty days, mate, and females lay the next generation of eggs. 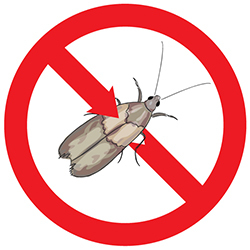 Direct damage to grain is the result of the Indian meal moth larvae feeding on the seed germ. Grain mold can become a problem. The biggest reduction in value is the result of contamination by larvae that leave droppings and silken webs in the grain. The presence of live insects and insect parts pretty much spoil the grain. 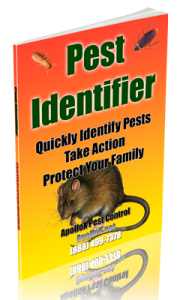 Call ApolloX Pest Control for Indian meal moth pest control in the Fairfield County CT towns of Fairfield, Black Rock, Bridgeport, Cos Cob, Darien, Easton, Greenfield Hill, Greenwich, New Canaan, Noroton, North Stamford, Norwalk, Old Greenwich, Redding (lower), Ridgefield (lower), Riverside, Rowayton, Shelton, Southport, Stamford, Stratford, Trumbull, Weston, Westport & Wilton.